The CMA is seeking stakeholders’ views on new advice to help care homes meet their consumer law obligations. The consultation follows the completion of the CMA’s year-long market study into the care home sector for the elderly that found a risk of residents being treated unfairly and of some care homes breaching consumer law (see BREAKING NEWS: CMA finds £1bn care funding shortfall). Draft advice compiled by the CMA advises care homes on what they should do to comply with consumer law, including: what upfront information they need to provide prospective residents and their residents to help them make informed choices; what they need to do to ensure their contract terms and the way they treat residents are fair; their obligation to provide services to residents with reasonable care and skill; and what they need to do to ensure their complaint-handling policies and procedures are easy to find, easy to use and fair. The CMA revealed earlier this month that it had secured £2m in compensation for residents for upfront fees paid to Sunrise Senior Living (see CMA secures £2m compensation for Sunrise residents). 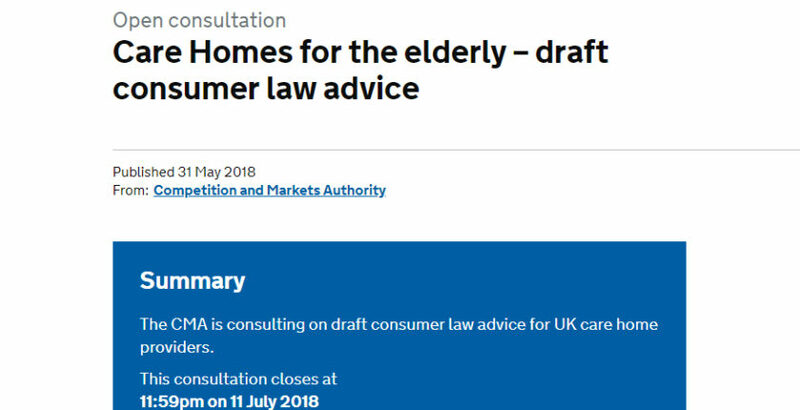 The consultation, which closes on July 12, is seeking the views of a range of stakeholders, including care homes and their representative bodies, enforcers such as local authority Trading Standards Services and sector regulators, as well as residents and their families, and charities representing the elderly and consumer groups. As a further part of its ongoing work on consumer protection in the care home sector, the CMA has also published its final advice on the charging of after death fees following a consultation earlier this year. Maria Mallaband announced in January that it had dropped its after death fees following CMA action (see Maria Mallaband drops ‘after death’ fees following CMA action).